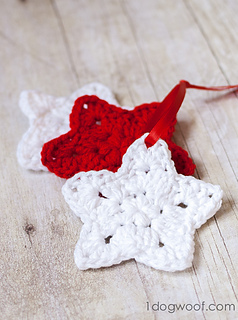 I don’t know about you, but I get a lot of inspiration while wandering through Pinterest, and when I saw these crocheted stars, I knew I wanted some. But there was no pattern at the end of that rainbow, so I fall back on my “I saw, I want, I conquer” process. This involves me, on a couch with some cheap yarn, a hook and a lot of crocheting and uncrocheting. Still, I got something that works and looks similar enough, so here’s the crochet star ornament pattern at the end of your rainbow. Or for your Christmas tree. puff stitch – Yarn over, insert hook into ring, yarn over and pull through. Repeat from * 2 more times. You should have 7 loops on your hook. Yarn over one last time, and pull hook through all the loops on your hook.